Tailoring - My weakness. It’s time to embrace autumn in Sydney, even though it’s still as warm as a British summer it has to be one of my favourite times of year. The mornings are colder, the sun is less harsh and it’s nice to have the opportunity to style an outfit without worrying about the heat. Linen occupies quite a bit of space in my wardrobe, and still opting for this fabric moving into autumn. I can’t remember the last time I wore a suit, and after rocking this cream one only last week makes me want to invest in more. Next on the agenda will be finding a pant suit. I’ve also come to the conclusion that if I am to buy an investment piece this season it won’t be a handbag. It’ll be a blazer, and yes I have my eye on a few. 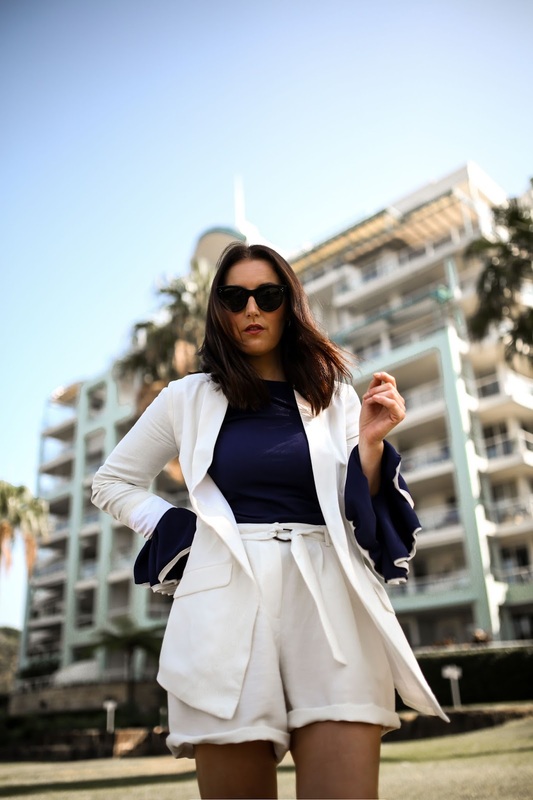 It has to be the most versatile wardrobe staple, and it’s just the right warmth for Sydney. Perfect moving into winter worn layered and a necessity for spring mornings. It’s been a while since wearing my white Gucci’s - Hello old friend. Honestly, my problem is if shoes are kept in a box I forget about them! Does anyone else have this problem?! They are the perfect height for the cut on these shorts. I couldn’t imagine wearing this suit with heels, but loafers work. I even think sneakers would give this look an edgy spin and might even brave them when I finally find my dream cigarette pants and matching jacket.